Alexa Westley and Teddy Meredith ran the two fastest times in course history, the Westfield boys won a thriller, the NJ #1 North Hunterdon girls won its third straight championship, Voorhees swept and the Mendham boys threw down an impressive victory at the NJSIAA North Jersey, Section 2 Championships on Saturday at Greystone. Westley, running with some extra motivation, tore apart the 3.1-mile layout as the junior at Warren Hills hammered her way to a course record 17:24 to win the Group 3 race. Westley's 17:24 shattered the course record of 17:36 set last month by Abby Loveys of Randolph at the NJAC Championships. Westley had the course record of 18:02 before Lovey's broke it. Westley was fueled by the fact that she wasn't predicted to win by some experts, and by her desire to reclaim the record. Westley also wanted to turn in a great performance as she prepares for should be an epic showdown between herself, Alyssa Aldridge of Mainland, and Monica Hebner of Northern Highlands in the state Group 3 race next Saturday at Holmdel Park. The boys course record, which was 15:31 before the day, was broken in back-to-back races and by the end of day, five runners went under the old record. First, Chris Romero ran 15:28 to win the Group 2 race to lead Voorhees to its fourth straight sectional title. Then, less than a half hour later, Meredith ran 15:27 when he rallied to win the Group 3 race. Meredith, who has come back strong after dealing with an Achilles injury at the start of the season, used his great leg speed (he's a 4:15 miles) to outkick Jack Stanley of Mendham, second in 15:29, and Matt Santamaria of West Windsor North, third in 15:30. Fahd Nasser of McNair also ran under the old course record when he won his second straight Group 1 sectional title in 15:28. The most dramatic team race of the day came in Group 4 as NJ #6 Westfield edged NJ #5 North Hunterdon, 48-49, to increase its NJ Sec 2 record total to 21 total titles. North Hunterdon, running without No. 1 runner Ray Sellaro, had three runners in ahead of Westfield's No. 2 man, but Westfield put its No. 7 runner ahead of North Hunterdon's No. 4 as the Blue Devils rallied for the win. Sophomore Gavin Richards of North Hunterdon won the race in 15:49, a personal best by 41 seconds. In another highly anticipated showdown, NJ #7 Mendham won its first title since 2011 with a 56-68 win over West Windsor North in Group 3. NJ #4 Hopewell Valley was third with 69. Mendham averaged a course record 15:59.8. The most eagerly awaited girls team race was in Group 4 as NJ #1 North Hunterdon averaged a course record 18:46 and defeated NJ #3 Ridge, 28-45, for its third straight title. NJ #8 Westfield was third with 78. Junior Ellie DiMarcello led the charge for North Hunterdon by winning her second straight title in 18:19. In the Group 2 girls race, junior Lauren Wagner, the Central Jersey, Group 2 winner last year, finished first in 18:24 to spark Voorhees to its and its 17th overall title. 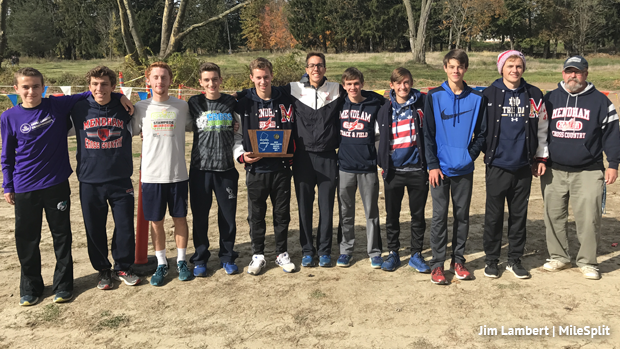 It was an incredible day for Voorhees as the boys put five runners in the top 12 and the girls crammed five runners in the top 13 as both teams ran away with the sectional titles. In other highlights, the NJ #4 Middletown South girls repeated as Group 3 champions, Whippany Park won its second straight boys Group 1 title, 39-49, over McNair, and the McNair girls captured its first title since 2012 by winning the Group 1 title, 21-49 over Verona.